I love any kind of Rocky Road. It’s basically a fancy pimped up biscuit, and I’ve got so much time for that. 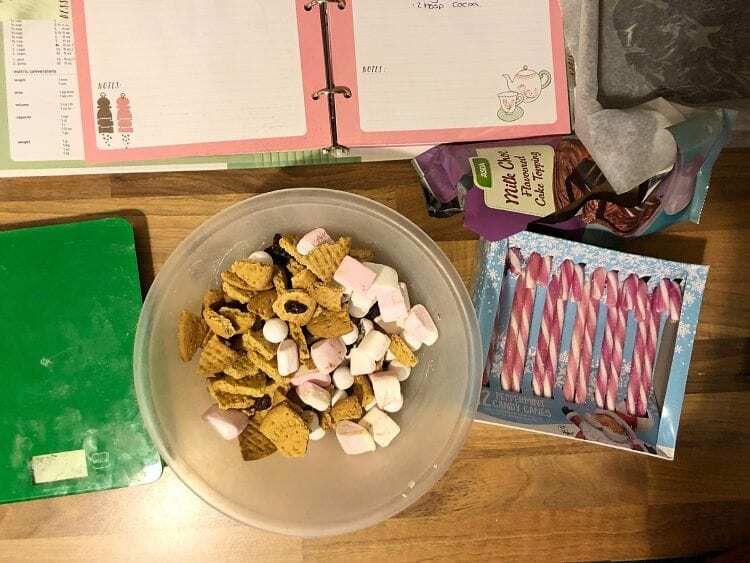 Christmas is kind of the perfect time for it too, because there’s loads of yummy sweets and chocolates everywhere for you to throw into your Christmas Rocky Road. I love Christmas. But while I start my shopping as soon as Robyn and Jim’s birthday is out of the way in November, I don’t really go all out festive until December. We put our tree up on the 1st, and then it’s all go! I love the decorations, especially sitting watching Christmas films with the lights on the tree. I don’t even mind the bad weather too much in December. It’s just all part of the mounting excitement. Frankly, if you don’t gain half a stone over Christmas I’m not sure that you’ve done it right. We eat all of the Christmas chocolates and treats. I bake lots of cakes and puddings and we stock up on every cheese going. Don’t get me wrong, I hit the gym hard in January to make up for it, but in December I overindulge like mad. Anything goes. I love Rocky Road. I think it’s the kids favourite things to make. They love finding all of their favourite treats to fill it up with. They love chocolate, biscuit, raisins and marshmallows, so these are a must. But they like picking what else they want in it. 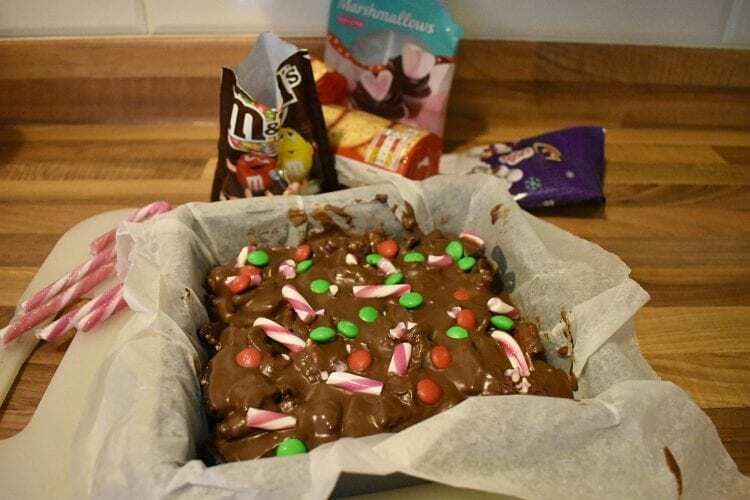 For our Christmas Rocky Road, we went for green and red m&m’s, broken up bits of candy cane and Cadbury’s snowballs. The candy cane adds a wonderfully minty burst, as well as a different texture and I absolutely love Snowballs. They’re a bit like mini eggs and we could eat them forever! 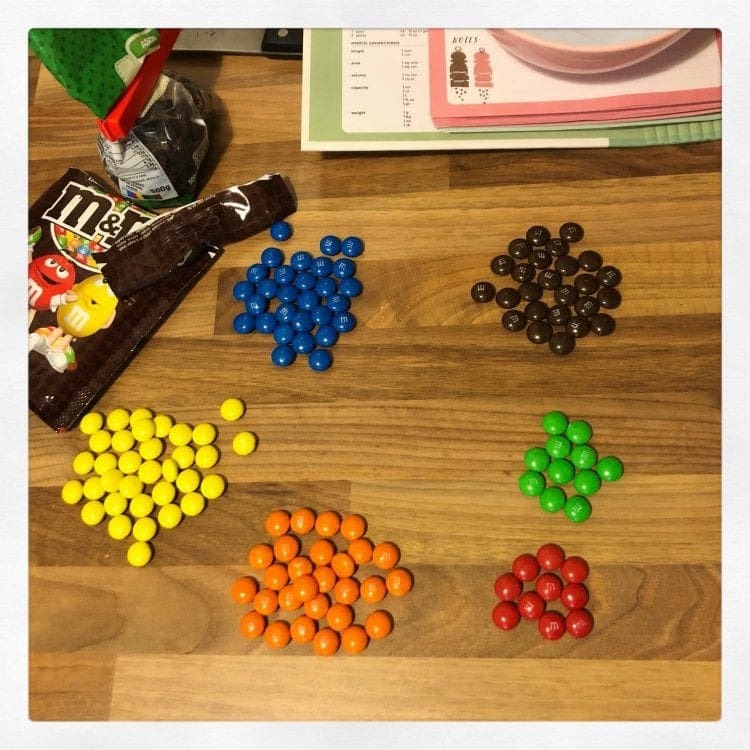 I tend to freeze my snowballs and my m&m’s for an hour or so first, just so that they hold shape and colour when you cover them in hot chocolate. 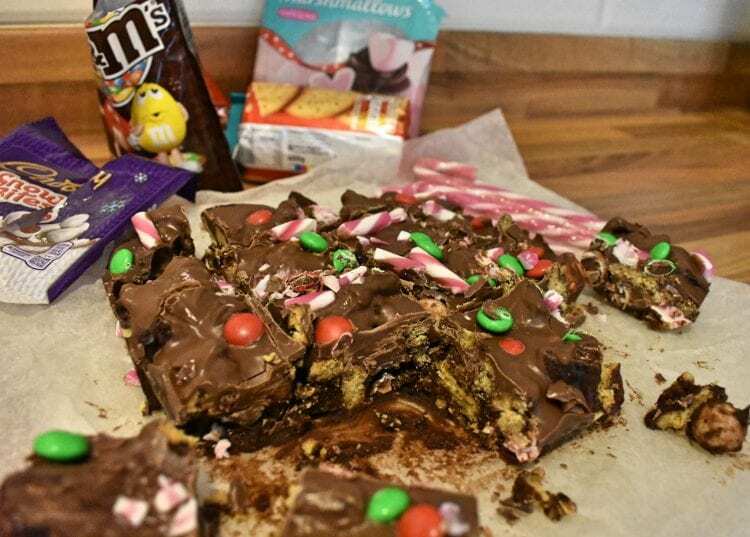 I must say, the m&m’s in my Christmas Rocky Road totally failed me. Asda didn’t have the festive special, which are all red, green and white, so I thought I’d just get a normal bag and pick them out. There’s about 8. There are much more of the other colours. It’s anti-Christmas and it’s not the first time!! When I make Rocky Road, I have 2 standard recipes. For one, I just mix together all my bits and add melted chocolate, reserving about half of it. I mix this together until it’s all covered. Then I press it into a baking tray and top with the remaining chocolate. This gives you a yummy firm Rocky Road. It sets hard, and works well. My other recipe, includes covering the mixture in melted butter, chocolate and golden syrup, and then topping with chocolate. This gives you a hard top, but the middle is a little bit softer, while the biscuit stays crunchy. 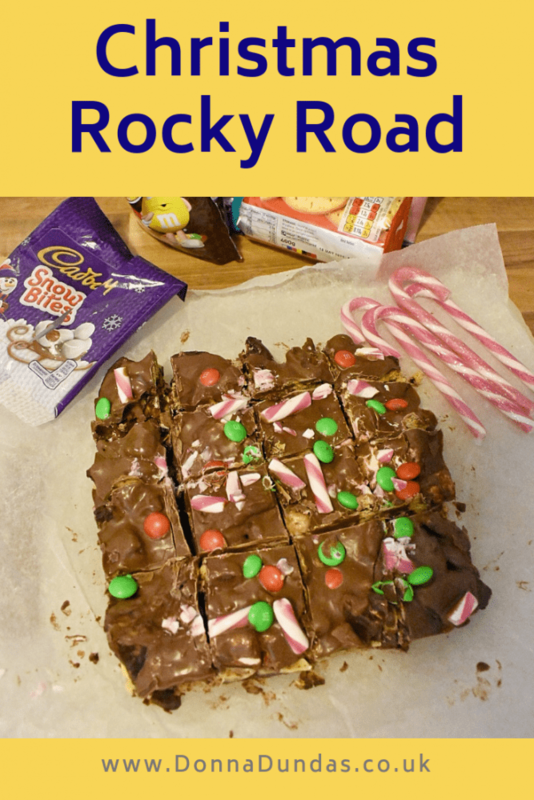 My Christmas Rocky Road is quite thick, with so much going on, so I find the softer recipe makes it a little easier to eat. I usually use mini-marshmallows, but on this occasion, Asda (I’m an online shopper) sent me big heart shaped ones instead. I just ripped them in half to use. It really doesn’t make any difference, use whatever you can. An easy Christmas treat and a great way to use up your festive leftovers. Line a deep baking tray with greaseproof paper. Break the biscuits into large chunks and place in a large mixing bowl. Add the raisins, marshmallows, and snowballs and mix well. In a small saucepan over a medium heat, melt together the butter, 200g of the chocolate and the golden syrup, stirring until smooth. Pour this mix over your biscuit mixture and stir until well coated. Tip this mix into your baking tin and press down and into the sides. Once solid, melt the remaining chocolate and pour over, spreading evenly. Top with candy cane and m&m’s and return to the fridge to set. I use a tin that’s 8”x8” and 2 inches deep. 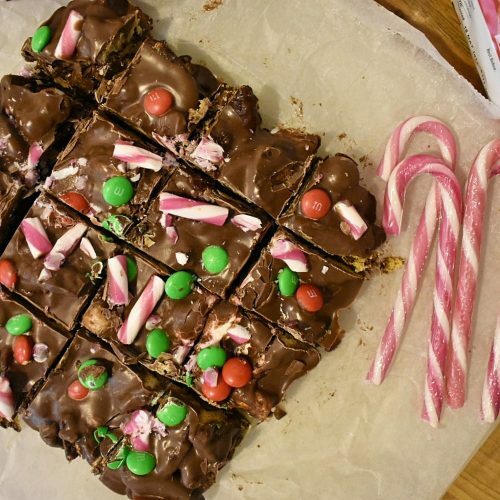 You can use any Christmas chocolate and candy that you’ve got in as substitutes. I put my m&m’s and snowballs in the freezer for one hour using.